Microsoft professionals are looking more and more into Adobe since the announcement of a strategic partnership between the two editors. Last May, I attended the Adobe Summit EMEA conference in London, and I was impressed by the very advanced vision Adobe had on customer experience. Many C-levels & VPs (from T-Mobile, BMW, Coca-Cola, Adidas, Hostelworld.com…) shared testimonials and success stories that reinforced Adobe’s leadership in the Digital Marketing space. 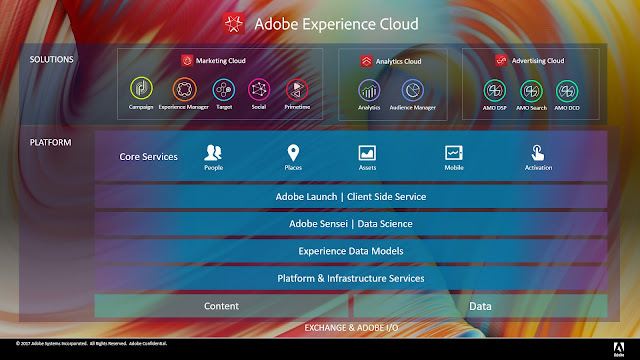 On top of their vision, Adobe built (or acquired) a powerful set of interconnected solutions that meet their clients’s marketing and experience management ever-growing needs. These solutions are offered under the “Adobe Experience Cloud” umbrella. 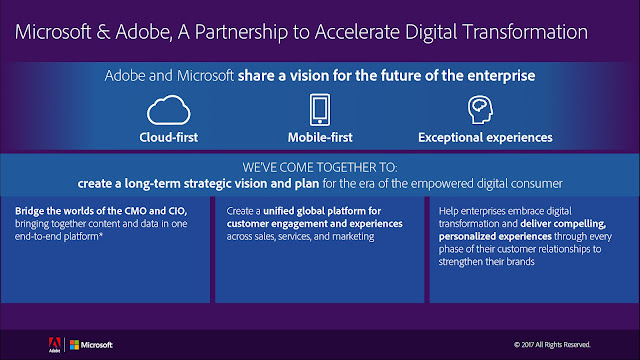 On September 26th, 2016 Microsoft and Adobe announced a strategic long-term partnership. 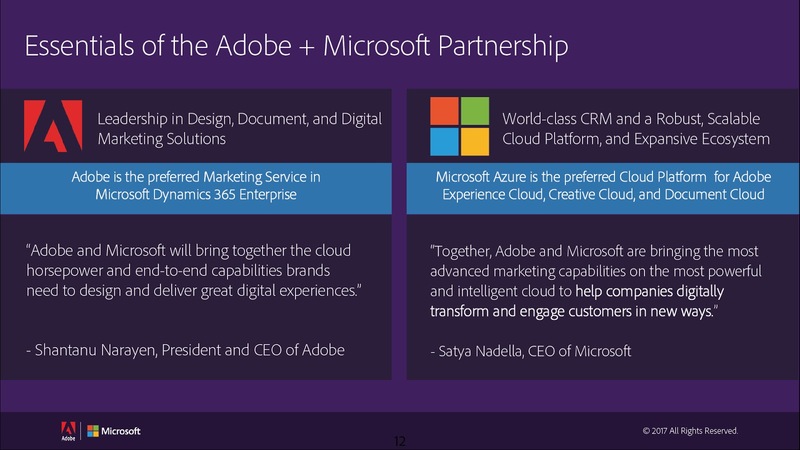 Adobe brought in its expertise and leader position in Digital Marketing while Microsoft brought in its Cloud experience (Azure) and its Business Applications (Dynamics 365). Bridge the worlds of the CMO and CIO, by bringing together content and data in one end-to-end platform. Create a unified global platform for customer engagement and experiences across sales, services, and marketing. Help enterprises embrace digital transformation and deliver compelling, personalized experiences through every phase of their customer relationships to strengthen their brands. What have Microsoft and Adobe committed to with this partnership? 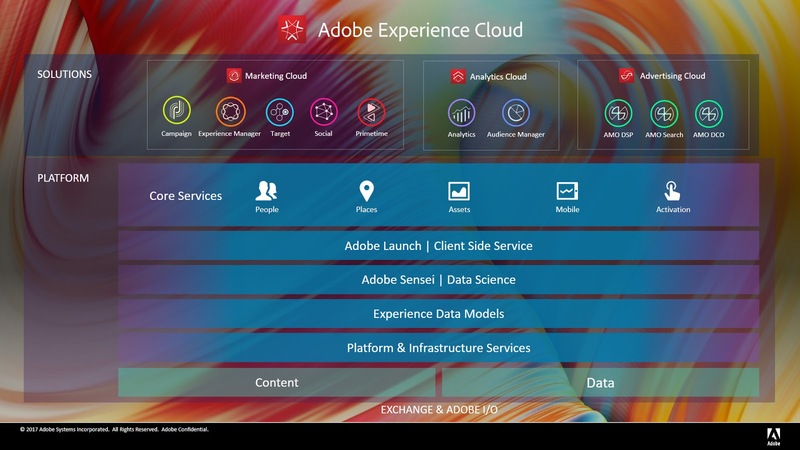 Adobe will make Microsoft Azure its preferred cloud platform for the Adobe Marketing Cloud, Adobe Creative Cloud and Adobe Document Cloud. Microsoft will make Adobe Marketing Cloud its preferred marketing service for Dynamics 365 Enterprise edition. This is especially targeted at customers for which solutions such as “Dynamics 365 for Marketing” (Business Edition) or from ISV (like ClickDimensions) are not sufficient in terms of capacity or functional coverage. How is this partnership technically implemented today? Integration of Microsoft Dynamics 365 with Adobe Campaign (the entry point in the Experience Cloud). Use of the Data Visualization (DataViz) capabilities of Microsoft Power BI with Adobe Analytics. Establishment of an industry-standard semantic data model to provide a common language for understanding and driving real-time customer engagement. 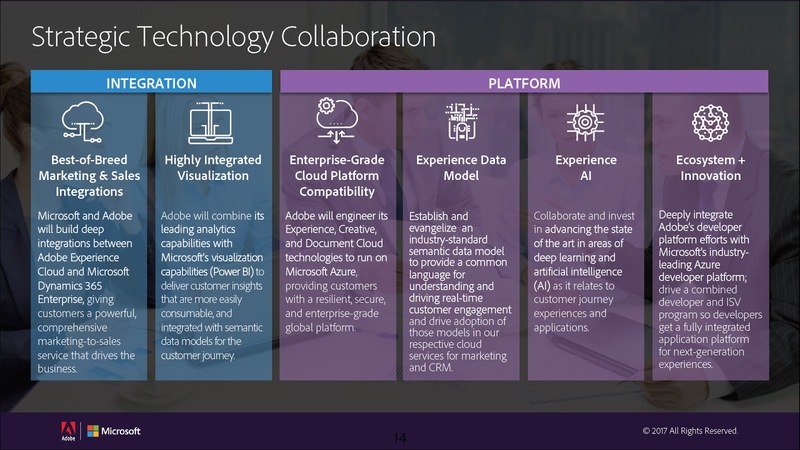 Integration of the Adobe’s developer platform with Microsoft’s developer platform to drive a combined developer and ISV program. As a conclusion, one can wonder how current Microsoft and Adobe partners are going to position themselves on the market to offer end-to-end solutions to Dynamics 365 and Adobe Marketing scenarios. As a matter of fact, as of today, few of them cover both technologies. And even if Microsoft and Adobe respectively opened their training portals to their partners (Dynamics Learning Portal for Microsoft and the Solution Partner Portal for Adobe), both technical universes remain complex to master for new-comers. Some, such as Avanade and Accenture Interactive, already have the teams that can cover the full technical spectrum of these editors, but they still have to train architects to design end-to-end solutions leveraging Dynamics 365 + Adobe Marketing.